My Big Flat Japanese Dumpling. An order of gyoza at a Japanese restaurant is almost never bad — a row of six pan-fried dumplings, translucent skins browned and crisped, the pork filling spiked with garlic, ginger and scallions. You dip one into the tart sauce and bite daintily or scarf the whole thing, huffing a little around the steamy mouthful if you couldn't wait for it to cool. And if you're not eating alone, when you open your eyes again the pretty rectangular serving plate will be empty but for the gloss of oil where they sat. You could blame your greedy tablemates, but should your loyalty even be tested this way? The appetizer-only gyoza system sets us up to turn on one another, to face the isolation of hunkering steam-faced over our meals, elbows set to block interloping chopsticks. And worst of all, you may never know the luxury of actually eating your fill of dumplings. At home, nobody makes six dumplings. When I was a child, my grandmother, my mother and I sat around our creaking kitchen table and stuffed dozens upon dozens of gyoza for dinner, not appetizers. Those broads were fast, too. Occasionally crooking an eyebrow at my fumbling, they quickly spooned the meat from a glass bowl and sealed eerily uniform pouches that spoke volumes about their experience and near-diagnosable perfectionism. We lined them up like platoons on plates and cookie sheets. Over the years my recruits stood more at attention. We fried them in shifts, filling a large bowl into which my family's chopsticks descended, emptying the bowl a few seconds before my grandmother — always on last frying duty — filled it again with a hot batch. My brother and I ate with abandon and a little competition, cheeks bulging, the dumplings snatched from the bowl and only tapping our plates before landing in our mouths. When we leaned back at last in our chairs, stuffed and panting, she slid the extra batches — always extra batches — into containers for later. Unlike Italian, you can't eat Japanese family-style except, well, at home with a family. 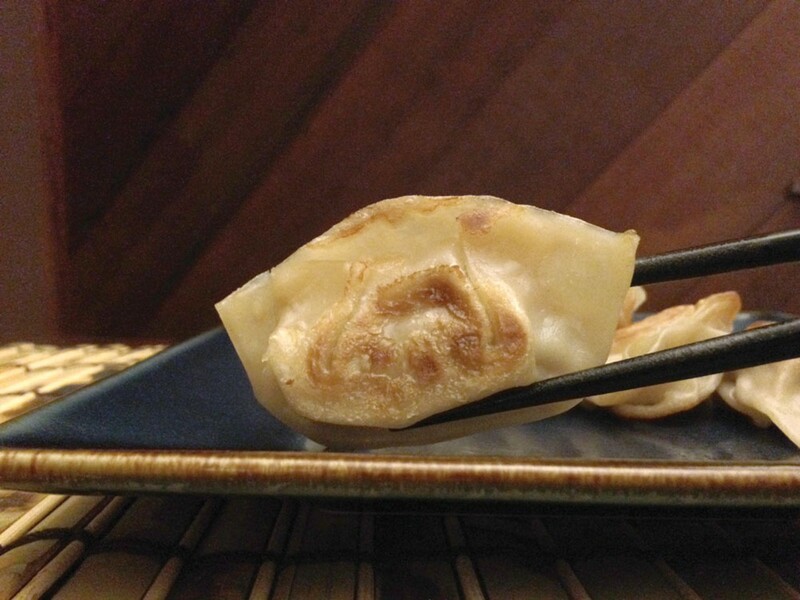 The good news is that building your own army of gyoza is a learnable skill. This is my grandmother's recipe, converted into measurements from the traditional eyeballing and sniffing, sampling and kibitzing. Did you just wonder if you could use ground turkey? Put this down and go think on your sins. 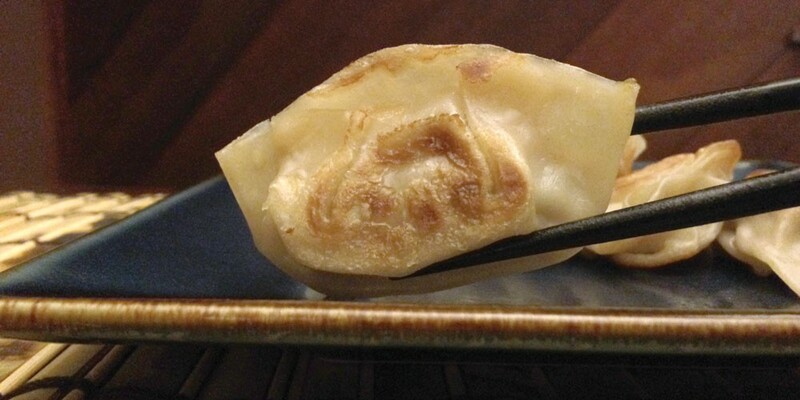 Gyoza require pork, fatty ground pork that's blushing pink — not the lean stuff, which will yield dry, flavorless dumplings. However, not even my grandmother would look askance at you for using packaged dumpling wrappers; we always did. While this is a nice shortcut, be sure to give yourself plenty of time to make the filling and stuff the dumplings — at least 90 minutes the first time out. Once the filling is mixed, you can always fry a spoonful in a pan to see if you want to adjust the seasoning. If it's your first time stuffing dumplings, a plastic press like the ones sold in Asian markets isn't a bad idea — they're fun for kids, too. Or you can try the simple fold below using square wrappers. Don't fret if your first efforts are sad and misshapen. You'll get the hang of it and, if you get friends or family in on it, you can laugh together until you do. If, however, you are overcome with frustration and the prospect of developing dumpling-related carpal tunnel is too much, don't panic. Just lay some wrappers in the pan to cover the bottom completely. Spoon and spread ½ inch of filling almost to the edges and cover it with another layer of wrappers. 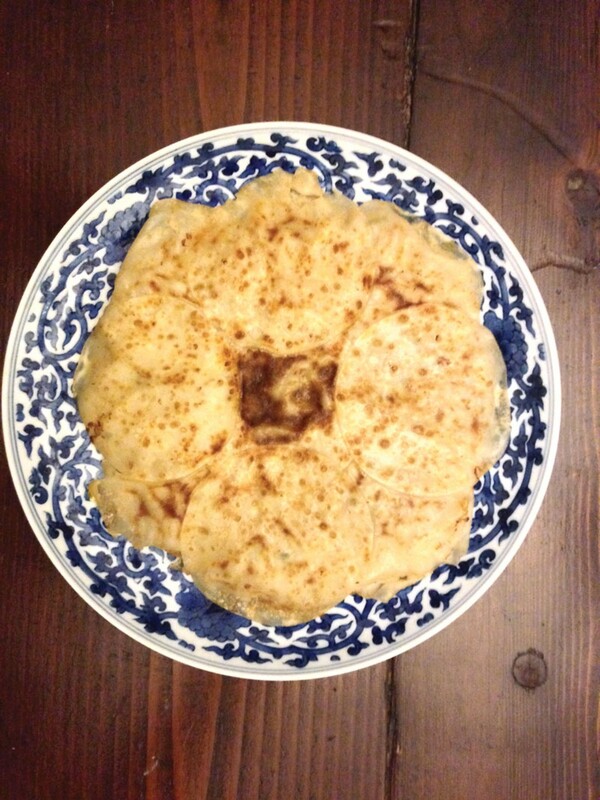 Fry up this quesadilla-looking thing the same as you would the dumplings, only use a plate to flip it. Once it's done, cut it into wedges and serve, refusing to answer any questions about how making dumplings went. Combine filling ingredients in a bowl with your hands. Don't over-mix. Let the mixture rest refrigerated for 20 minutes. Scoop ½ tablespoon of filling into the center of the dumpling skin. Dip a finger in your water bowl and wet the edge of the wrapper on one side. Fold the skin in half, forming a triangle and pinching the top sealed. Holding the belly of the dumpling, use your thumb and forefinger to push the outer corner up and form a pleat on each side. Pinch it in place and do the same on the opposite corner, sealing the dumpling completely. In a nonstick pan, warm a quarter-sized drop of vegetable oil over medium heat. 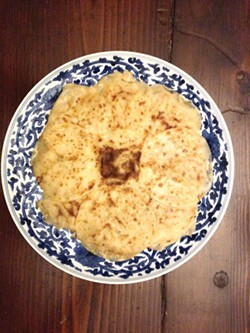 Arrange a single layer of dumplings in the pan and let them brown 3-5 minutes. Pour in 1/8 cup water and cover the pan for 4-5 minutes until they're steamed and the skins are translucent. Remove the cover to let the water evaporate and add another teaspoon of oil to the pan, frying until the bottoms of the dumplings get crispy brown again. Flip them if you like crust on both sides. Serve with small dishes of dipping sauce, and gorge.